ChartTooltipBehavior is responsible for rendering concise information about a data point in a small popup which displays close to its relevant data point. This code example assumes that there is an existing instance of RadCartesianChartView which is initialized and populated with data. You can see how to do this here. ChartTooltipBehavior has several options for configuration. The most commonly used would probably be the tooltip trigger mode. 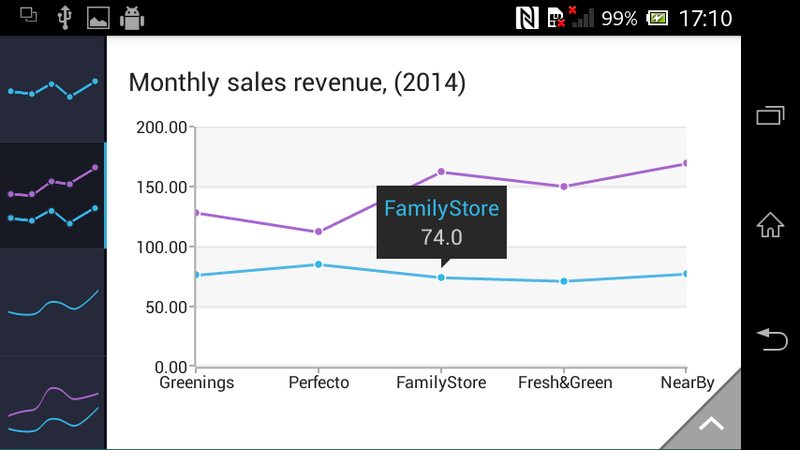 The chart tooltip can be triggered either with a hold or a tap gesture. This is controlled with the getTriggerMode() and setTriggerMode() methods. The tooltip behavior can display its tooltip through code via the open() and close() methods. Finally ChartTooltipBehavior is integrated with the chart palettes, which means simple color modifications of the existing tooltip view can be quickly achieved by simple modification of the existing palette as shown here.